Pickup Some Creativity: New Sheers, take one. I bought this filmy stuff wanting to make some sheers for the sidelights of our front door (we had to get rid of those hideous mini blinds) and the master bedroom. Then all the craziness of the holidays set in, and I got sidetracked. I know I have adult ADD. I just get so easily distracted these days. Anyhoo, I did get the sheers made for our front door. I found cheap hardware at Wally World which I spray painted ORB, and then got going on the drapes. My son took this photo without me knowing! You love my painting outfit? Those jeans are smeared with paint and caulk from our old house. Ahh, the memories. Here is a close up of the drape before I hung it. 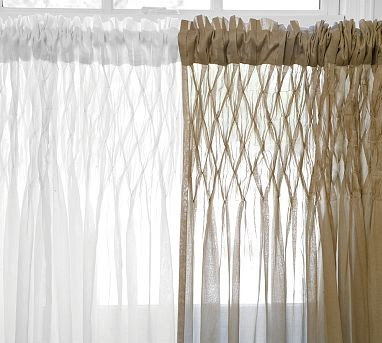 All the sides were narrow-hemmed, with a casing at top and bottom for the curtain rods. Then, at equal intervals, I added small seams which alternated by row to create a smocked effect. Hung up, with mixed results. I've learned a few things. First up, I need to add a lot more smocking. I think next go-around I'll shirr the fabric on the rod and then mark where I want the smocking to go. Second issue, these are WAY too transparent, as you can see. So, they work for now, but definitely not a final solution. The smocking is really pretty. I've never been brave enough to try anything like that. They really do look like your inspiration photo! I love it that your son is helping out with your blog by taking photos of you!!! it's a great photo and I also love the idea of the smocking it is really pretty. I am also grappling with a window and transparency. I recently found this post on using starch to adhere fabric to windows. It is kind of interesting. smocking is cool! It looks like fun! I have a pair of paint splattered pants too! oh wow. i'm impressed by your ambitiousness. curtains + smocking = way out of my league. I am really digging the shape on your door. I see the smocking loss some of it's gather when it was hung, bummmer when it doesn't turn out like u pictured in ur head, but it works. I have the same problem with side panels at my front door, I think we bought the frosted vinyl for privacy but it still lets in some light.